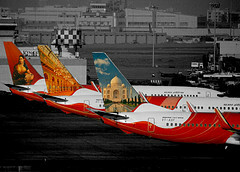 Airliners-India :: View topic - A blast from the past: AI in 1960s. A blast from the past: AI in 1960s. Posted: Tue May 06, 2008 5:38 pm Post subject: A blast from the past: AI in 1960s. An article on AI in the Time magazine. The world's least inhibited air traveler has long been Air-India International's advertising symbol, a little maharajah with striped turban and quivering wax mustaches. He thinks nothing of matching entrechats with a Moscow ballerina or—since transatlantic service began in May ­swapping his turban for a Texan's Stetson and a pair of shooting irons. So distinctive is the maharajah that the American Society of Travel Agents in 1959 voted AII first place in a 400-entry travel poster contest. This year the Indian Society of Advertisers gave its top award to the maharajah's originator, Air-India's commercial director, S. K. ("Bobby") Kooka. Despite such honors, Indian politicians last week were demanding the elimination of the maharajah.